Tell me again, why are Breivik and Tarrant still alive? The arguments against capital punishment can generally be classified under the following headings. They are not convincing in the face of evil. There have always been situations where killing of some humans has been considered, not just not immoral, but actually a moral duty. To kill people of opposing faiths was justifiable for a long time. To put enemies or sufficiently “bad” people to death was once a moral duty. Even something to be proud of. It is no different today. For ISIS and other “terrorist” organisations killing the enemy in particularly brutal ways is something which is not only something to be proud of but also something which opens the gates to Paradise. Armies are trained to, and assessed, by their ability to kill the enemy – in bulk. Collateral damage is regrettable but allowed. It is never immoral. Many states allow individuals to kill when their own survival is threatened. Many other states do not. Many states exercise capital punishment for really “bad” people. 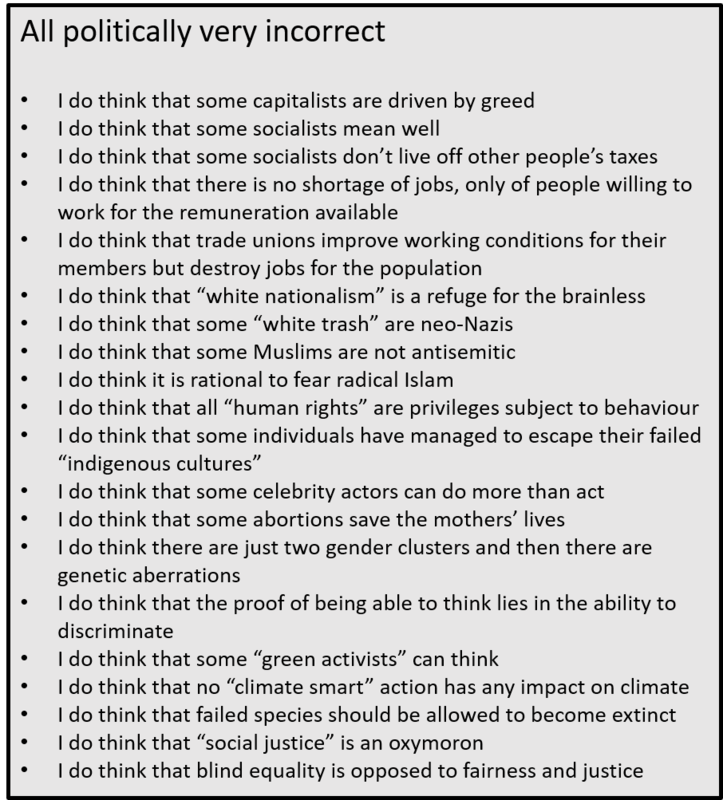 Many other states do not and many of these mollycoddle the cancerous humans among them. In more “liberal” quarters the number of euthanasia deaths and abortions carried out have become something to be proud of. Paradoxically, the states which are most opposed to capital punishment are also the states which are most in favour of abortion and the “mercy” killings of the aged or the terminally ill. There is no such thing as a “human right” to life. Any individual’s life is “cabined, cribbed, confined” by his genes, the privileges accorded by the surrounding society and the quirks of random events. As with all so-called “human rights” living is just another privilege. A week ago (8th March) it was 5 years since Malaysian flight MH370 – a Boeing 777-200ER – vanished without trace, taking 239 passengers and crew to their deaths. The disappearance is still a complete mystery but all the various theories include a sudden steep, fast climb to about 45,000 feet followed by a very sharp dive down to about 23,000 feet. Such an uncontrolled ascent would have caused a very rapid decompression (explosive or rapid) which, in turn, would have incapacitated all aboard. It now looks increasingly likely that both the Lion Air crash in Indonesia (189 dead) and the Ethiopian Air crash (157 dead) were caused by equipment/software faults which ultimately caused rapid, uncontrollable descents. It seems to me that Boeing’s liability for the deaths on Ethiopian Air is very likely. Boeing may well have liability also for the Lion Air deaths, especially if the unpreparedness of the pilots for sudden malfunction was due to incomplete manuals and/or a deficiency in the training provided. It is the uncontrolled nature of descents which link the two latest crashes. In both cases the pilots tried to correct for the faulty equipment trying to push the nose down by climbing very rapidly. It begs the question whether this fault of the automatics pushing the nose of the aircraft down – by whatever combination of software and equipment – was what also caused MH370 to change altitude rapidly. Was an uncontrolled ascent due to the pilots trying to correct the automatics pushing the nose down? Did hypoxia then incapacitate the crew? Could it be that the satellite evidence of the flight continuing (which is all interpretations of satellite data rather than clear physical evidence) is a red herring? Did MH370 actually go down soon after the final radar contact (Butterworth Air Base) was lost? 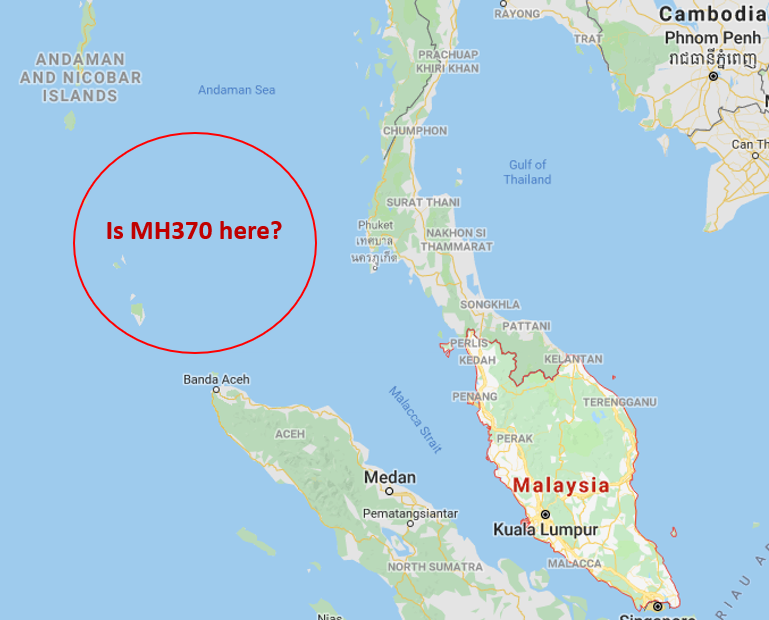 Are the remains of MH370 actually lying at the bottom of the Indian Ocean a little to the west of Malaysia. The Lion Air and Ethiopian crashes make it necessary to re-examine the disappearance of MH370 and including equipment failure possibilities which were considered impossible. MH370 – Looking in the wrong place? The most fundamental value there is, is the distinction between “good” and “bad”. It is a characteristic of every individual. For humans this value surely originated from long before we were anatomically modern humans. Within the world of living things, and whether the individual living thing is aware of the value or not, all that aids survival is “good” and all that does not is “bad”. The fundamental value scale of goodness therefore precedes language. Awareness of the value scale may need consciousness, but what is “good” or “bad” applies to every living thing whether it is conscious or not. Language, of course, is a means of “quantifying” thought. It is language which allows the past and the future and the abstract and the unreal to be described. Language has allowed us to describe many other value scales. Each scale seems to be independent though it is clear that many of the scales are related. (Length can be related to weight and thickness, beauty can be related to cleverness or to complexity, …….). I cannot find any value scale though, which does not always map – even if sometimes indirectly – to the value scale of goodness. It is as if “good” and “bad” are embedded in the framework of language, such that every other value scale we may describe always leaves a shadow on the scale of “good” and “bad”. It is therefore we tend to associate certain values with others and, I suspect, it is because of their underlying projection onto the good-bad scale. Beauty is good, noise is bad. Sweet is good, bitter is bad. Tall is good, short is bad. Thin is good and fat is bad. Certain combinations of values feel “right” and others feel very “wrong”. 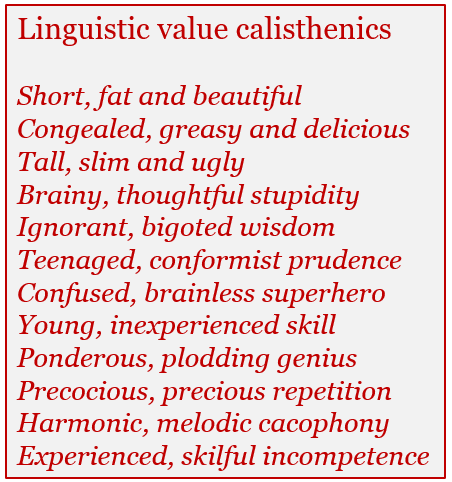 “Tall, slim and beautiful” feels right, but “short, fat and beautiful” is discordant in composition. Logic and – it would seem – fundamental valuations of good and bad are embedded in language. They make up the framework for language and non-compliance with the inbuilt logic or the values creates discomfort and a discordance. Boeing has to answer for 157 deaths. Update 1: Reuters reports that “The trim position of the stabilizer, which moves the jet’s horizontal tail, could help determine whether or not it was set nose down for a steep dive. …. …… part of a stabilizer found in the Ethiopian wreckage was in a unusual position similar to the Lion Air plane”. Boeing put MCAS in its planes as a protection against an aerodynamic stall, but in the case of the October flight, a sensor malfunction signaled that the plane was in danger when it wasn’t, causing it to dive automatically. Rather than switch off the motor triggering the dives, the pilots tried to counteract it with their controls until it dove into the sea. 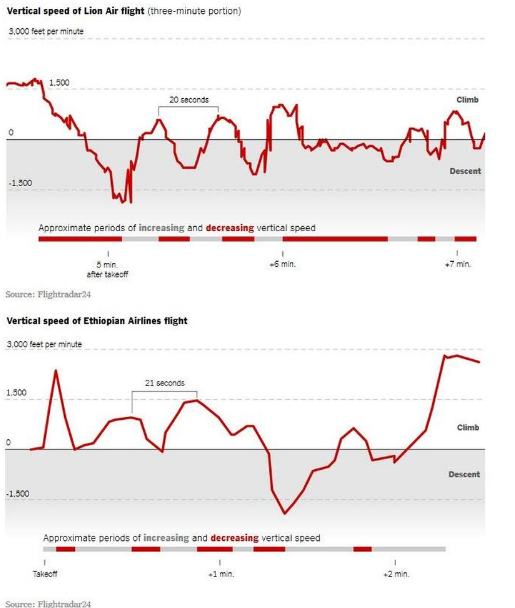 The Ethiopian flight showed similar “highly unusual descents followed by climbs”. Eurostat has released its “Birth and Fertility” statistics. 5.075 million babies were born in the EU in 2017, down from 5.148 million in 2016. The total fertility rate reduced to 1.59 births per woman, also down from 1.60 the year before. No country came anywhere near the 2.1 births per woman needed to replenish any population. France had the highest fertility rate at 1.90 births per woman, followed by Sweden (1.78), Ireland (1.77), Denmark (1.75), and the United Kingdom (1.74). The lowest fertility rates were in Malta (1.26), Spain (1.31), Italy and Cyprus (both 1.32), Greece (1.35), Portugal (1.38), and Luxembourg (1.39). The average age of first-time mothers is also increasing, at 29.1 compared to 29.0 years in 2016. The politically correct belief in the EU is that getting a large number of migrants from Africa will boost the work-force and allow pensions and healthcare for the elderly to be maintained. However this has been shown to be a little naive. Many new downsides have been introduced by the new migrants since they have been – relatively – unschooled, unskilled, reluctant to integrate and often requiring a much greater degree of state support, and for a much longer time, than the politicians had hoped for. Many migrants have been slower to enter the work-place than hoped. New stresses are being introduced by the reluctance (or the inability) of the migrants to adapt. Using immigration alone as an alternative to having children can never work. It only ensures the extinction of the “native population”. Having fewer children in all cases will always lead to the native population becoming extinct. Having fewer children and simultaneously having more immigration, only means that the native born population is swamped and suppressed before becoming extinct. EU politicians are often so enamoured of their pet theories that they are in denial about reality. Immigration can help to provide a demographic breathing space for a limited period and provided the number of migrants can be assimilated. But a permanent, continuous stream of immigration to keep a country alive, while the native population declines, is absurd. The simple demographic reality (which a few of the Eastern European countries have started to realise) is that any population – if it wants to survive – needs to replenish its children. The Hungarians have been criticised by the politically correct part of the EU for introducing incentives for having children. This criticism is particularly short-sighted (if not plain stupid). 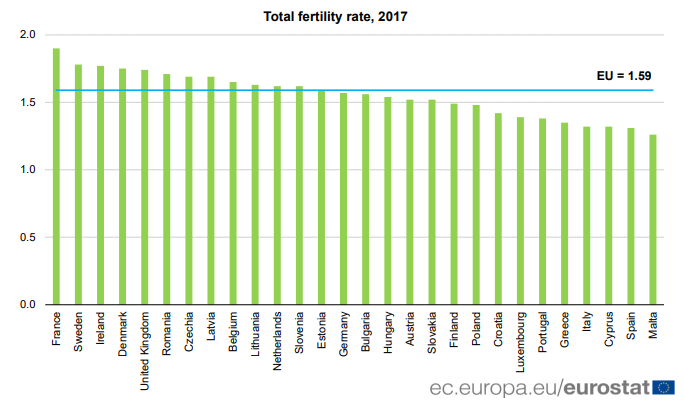 The EU needs fertility rates to increase and soon. Incentives for having children are inevitable and will become standard in almost every country. Well it now seems that Ethiopian crash was indeed a repeat. And if that is so then there is clearly a case of “manslaughter” possible against Boeing for the 157 lives lost in the Ethiopian crash (though the deaths in the Lion Air crash would be due to “misadventure” rather than “manslaughter”). Up until Wednesday, the FAA position was that a review had showed “no systemic performance issues” and that there was no basis for grounding the aircraft. The flight data is remarkably unstable. Within the last 12 months I have replaced a phone, a pair of speakers and a router since replacement was cheaper than the diagnosis and repair of a fault. The sophistication of technology in a large number of human appliances (white goods, cars, phones and airplanes) is now such that faults can no longer be rectified by the user. The frequency of faults is declining but when the consequence is the loss of life, that provides no comfort. Specialists – and usually more than one – are needed. In many cases the fault cannot be diagnosed and the faulty appliance is just replaced — with another probably containing the same fault. NASA compiles a database of voluntary pilot reports (ASRS) and this database contains at least 2 reports by US pilots who experienced problems with the auto-pilot keeping the nose down on B737 Max 8 & 9 aircraft. It is highly unlikely that the FAA does not factor these in. Canada today also grounded the aircraft. However they have stated that had studied satellite data and found similarities between the Ethiopian and the Lion Air take-offs. The ASRS database is the world’s largest repository of voluntary, confidential safety information provided by aviation’s frontline personnel, including pilots, controllers, mechanics, flight attendants, and dispatchers. The database provides a foundation for specific products and subsequent research addressing a variety of aviation safety issues. The US reports are about the autopilot rather than the anti-stall system. 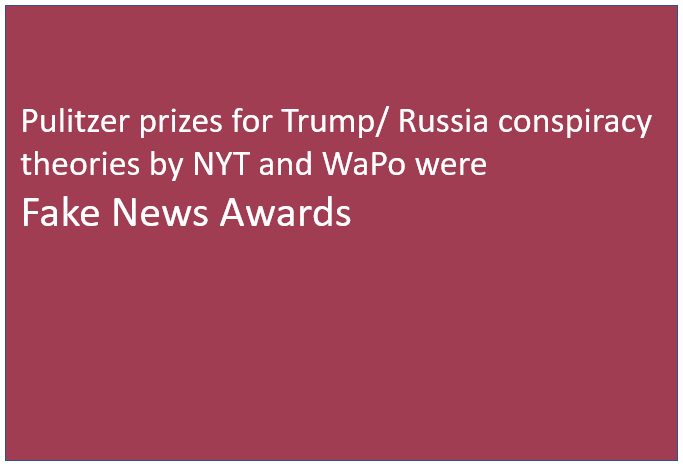 The US experiences are reported in PhysOrg. Airline pilots on at least two U.S. flights have reported that an automated system seemed to cause their Boeing 737 Max planes to tilt down suddenly. 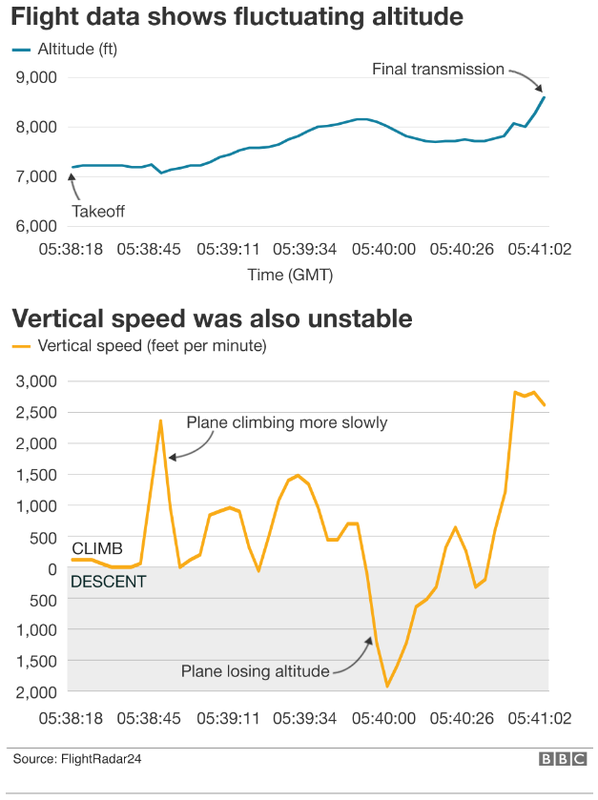 The pilots said that soon after engaging the autopilot on Boeing 737 Max 8 planes, the nose tilted down sharply. In both cases, they recovered quickly after disconnecting the autopilot.. The pilot reports were filed last year in a data base compiled by NASA. ……….. It was unclear whether the accounts led to any actions by the FAA or the pilots’ airlines. In one report, an airline captain said that immediately after putting the plane on autopilot, the co-pilot called out “Descending,” followed by an audio cockpit warning, “Don’t sink, don’t sink!” The captain immediately disconnected the autopilot and resumed climbing. “With the concerns with the MAX 8 nose down stuff, we both thought it appropriate to bring it to your attention,” the captain wrote. “Best guess from me is airspeed fluctuation” due to a brief weather system overwhelming the plane’s automation. On another flight, the co-pilot said that seconds after engaging the autopilot, the nose pitched downward and the plane began descending at 1,200 to 1,500 feet (365 to 460 meters) per minute. As in the other flight, the plane’s low-altitude-warning system issued an audio warning. The captain disconnected autopilot, and the plane began to climb. The pilots talked it over later, “but can’t think of any reason the aircraft would pitch nose down so aggressively,” the co-pilot recounted. Preliminary information released by Indonesian investigators suggests they are looking at the possible role of the Max’s new automated anti-stall technology as a factor in a Lion Air crash in October shortly after takeoff from Jakarta. Data indicates that the pilots struggled with repeated nose-down commands from the plane before it crashed into the Java Sea and killed 189 people. It is time for Boeing and the FAA, but primarily for Boeing, to ground the aircrafts till they have sorted out the clearly deficient software. 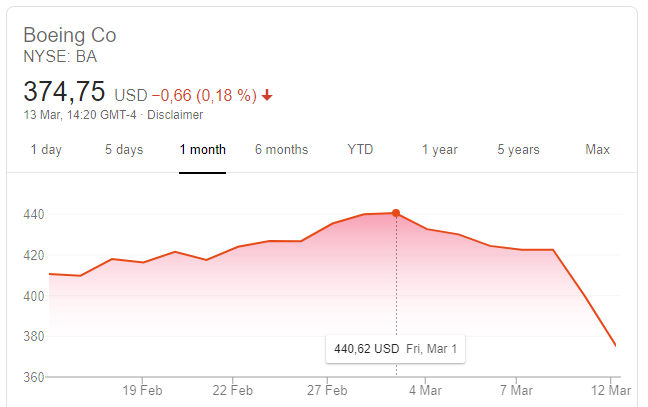 Boeing share price is in a decline if not yet in a nose-dive. I find there is no political party that I can truly identify with. I disagree every time someone tries to pin a political label on me. I suppose in the present risk-averse, CYA world, I am a political pariah. At my age it does not bother me very much. The list could be much longer of course. 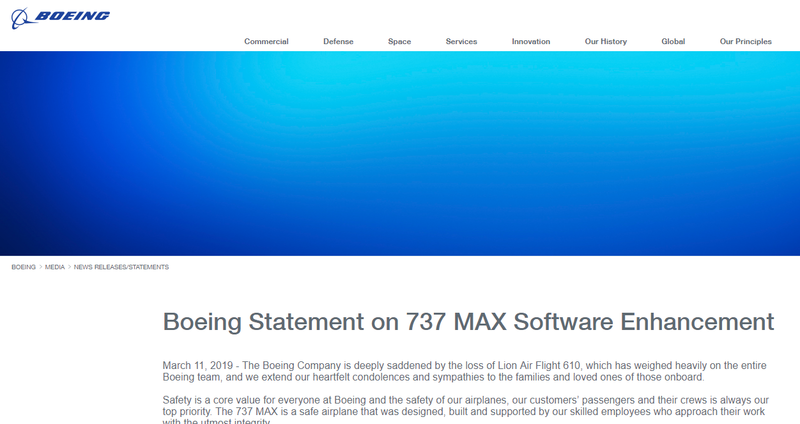 Boeing put out a statement last night. For the past several months and in the aftermath of Lion Air Flight 610, Boeing has been developing a flight control software enhancement for the 737 MAX, designed to make an already safe aircraft even safer. This includes updates to the Maneuvering Characteristics Augmentation System (MCAS) flight control law, pilot displays, operation manuals and crew training. The enhanced flight control law incorporates angle of attack (AOA) inputs, limits stabilizer trim commands in response to an erroneous angle of attack reading, and provides a limit to the stabilizer command in order to retain elevator authority. Boeing has been working closely with the Federal Aviation Administration (FAA) on development, planning and certification of the software enhancement, and it will be deployed across the 737 MAX fleet in the coming weeks. The update also incorporates feedback received from our customers. The FAA says it anticipates mandating this software enhancement with an Airworthiness Directive (AD) no later than April. We have worked with the FAA in development of this software enhancement. Today a number of other countries and airlines have grounded the aircraft. The UK joined the ban following Ethiopia, Singapore, China, France, Ireland, Germany, Australia, Indonesia and Malaysia. TUI and Norwegian are among the airlines which have also grounded the aircraft. It seems to me that instead of getting all their lobbyists to cast doubt on pilots or their training it should be Boeing which itself grounds the aircraft. 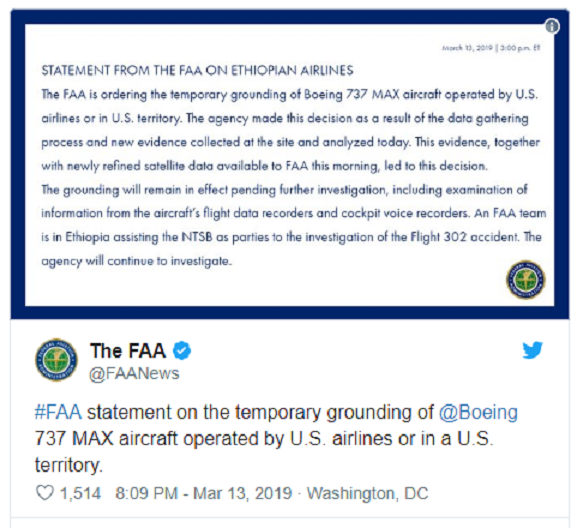 When Boeing itself is introducing the software enhancement as a result of the Lion Air crash, and possibly has the 157 deaths of the Ethiopian crash on their plate, it is unconscionable for them to allow the planes to fly.They cannot lean back and use the FAA as their backstop. The FAA itself needs to develop a backbone when it comes to US manufacturers. Boeing cannot just take the position that once was accident, the second merely coincidence and wait for a third crash.